16,000+/- Sq. 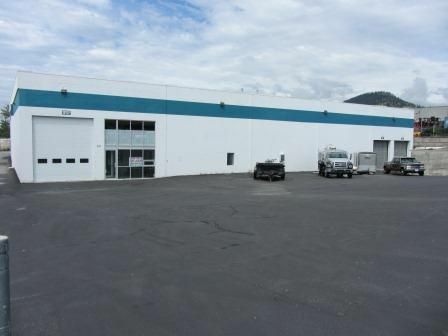 Ft multi-use, concrete construction, industrial building, with 22 ft. clear height ceiling, three 16 ft. overhead doors, 2 in building,covered, secure loading docks – 53 and 97 ft. long, 2 gantry cranes – 2 and 5 tons, 6 forced air suspended gas furnaces, ready for air lines. Includes 824 sq. ft. of new office space with 2 handicap washrooms. Fully chain link fenced .89 acre, paved site with lots of room for large transport trucks. Zoning allows wide variety of uses. Convenient location with easy access to Highway 97. Vacant and available for immediate occupancy.